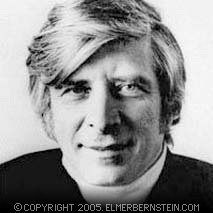 Though I have not had the privilege of hearing all of these historically famous film scores, there are at least a handful that are relevant in the context of examining Elmer Bernstein's astonishing body of work. Toccata for Toy Trains. I first read about this score in Film Score Monthly in an interview with EB, and its subject-matter immediately sparked my interest. In the early 1950s, as Elmer was on the verge of breaking big in the film industry, the composer provided music scores for a handful of documentaries produced by two very revolutionary and ingenious industrial, graphic, and architectural designers--Ray and Charles Eames. Their short films covered everything from Eames-designed lounge chairs, relative distances (showing the micro world of molecules to the macro world of the universe), and IBM at the World's Fair, to collectable toys, such as electric trains. After obtaining a copy of this rare score from the Film Music Collection series, I discovered Toccata for Toy Trains to be absolutely delightful and surely one of the most unique and whimsical works in the composer's canon. The music, composed for a small orchestra comprising flute, piccolo, oboe, clarinet, bassoon, trumpet, piano, and percussion, must have offered perfect accompaniment to Eames' electric trains as they winded their way through tiny landscapes, towns, and roads. Even without the context of the film, you know that the solo trumpet is announcing the departure of the toy train, while the piano ostinatos and eighth-note chords help it chug its way out of the station. Elmer's music bounces and bumps, twists and turns, and lovingly evokes the magic world of toy trains. It also demonstrates both the scholarly discipline of a serious composer and the imagination and fun-loving impulses of a child--something Bernstein maintained throughout his entire career. A careful listen to the piece reveals the seeds of ideas that will filter into Mockingbird's Roll in the Tire, Val and Gil's mischievous adventures through Manhattan in Henry Orient, and the Ghostbusters theme. You may even hear a brief piano chord progression that is strangely reminiscent of the Magnificent Seven galloping motif. The Silver Chalice. Every now and then, while listening to Franz Waxman's recorded scores, including the Silver Chalice, I hear a tiny snippet of music that vaguely reminds me of Elmer's compositional style. It's not imitation or plagiarism, but rather a kind of tonal color that both composers achieve in their arrangements and orchestration. This doesn't surprise me, as I know that Waxman was one of EB's favorite film composers. 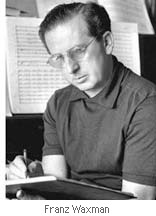 You can hear this kind of influence in other composers: John Barry from Bela Bartok, John Williams from Richard Wagner and Erich Korngold, Leonard Bernstein and Elmer from Aaron Copland, Danny Elfman from Nino Rota. Another thing common to both Bernstein and Waxman is their facility for writing passionate melodies, with equally fluid and lovely counterpoint. The Ghost and Mrs. Muir. Elmer has cited this score as having had a huge impact on his desire to write film music. It really is a tremendous work of art, experienced both in the film and on its own. Bernstein's sensitive treatment of the score leaves many of the cues exactly as they appeared in the film, rather than knitted together to lengthen the individual tracks. The intense yearning and unrequited affection between the two characters--one mortal, the other a ghost--is expressed beautifully through Herrmann's haunting leitmotifs. 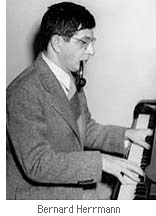 His harp arpeggio and woodwind writing might well have influenced Bernstein, who would have about 22 years old at the time of the film's release. This Film Music Collection recording, transferred to CD in 1975 by Varese Sarabande, is one of my all-time favorite non-Bernstein scores. The rich accents and fluid tempo changes within the cues ebb and flow like ocean tides, analogous to the love between Mrs. Muir and the sea Captain. It's a very passionate score and under the baton of Bernstein, it is transformed into something sublime. Indeed, I believe this recording is one of the finest examples of what a great conductor Elmer was. The orchestra is so unified, even through all the delicate twists and turns in the score. I always found this to be true on his own soundtrack recordings. The orchestra never sounds as if it's on the clock. EB always managed to bring the best out in his musicians, partly because of his perfectionism, and partly because I think he wanted them to have fun. Torn Curtain. Clear proof that the usually sound instincts of Alfred Hitchcock could be fallible, as he replaced Herrmann's serious score for a more upbeat, modern one composed by the talented John Addison. Under orders from the increasingly persnickety director, Addison produced something more along the lines of a pop score, having little dramatic tension or suspense. His use of a saxophone in the main theme and other cues seems oddly incongruous, but it may have been influenced by John Barry's popular Bond scores. Truthfully, Herrmann's score is pretty dark, and might not have played all that well either, but taken apart from the film as it is in the Film Music Collection, it really shows that Herrmann was still a very inventive and capable composer. Sadly, the film did not work on many levels, dampened by a lack of chemistry between Paul Newman and Julie Andrews, rather uninvolving dialog, and very little suspense, except for one really well staged murder of a Russian operative. Lukas Kendall, founding editor and soundtrack producer for Film Score Monthly, has released a limited addition anthology of all the scores originally issued for the Film Music Collection series as a boxed set. The set contains all the scores listed above, a hardback book with "insightful editorials, bios, archival photographs, articles, and more," plus a brand new recording of EB's score to Kings of the Sun, a long desired gem for soundtrack collectors.